The free concert series, [email protected], was begun in 2012 to enrich the arts scene in Encinitas for residents, visitors, and cultural tourists from throughout the region. It has become the highest attended daytime series in the county with weekly attendance of 150+. The 50 minute concerts at the Encinitas Library feature outstanding musicians from throughout Southern California performing all styles of music. We hope to see you often! Established musicians, who are interested in performing, are encouraged to contact City of Encinitas Arts Program Administrator Jim Gilliam at (760) 633-2746, or email. For a list of concerts this month, click HERE. Click here for information on upcoming concerts and to purchase tickets. Click here for the 2018/19 Music By The Sea season brochure. 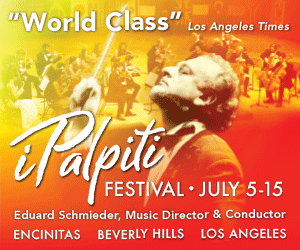 Since 2012, the City has partnered with iPalpiti Artists, International, as a host city for the iPalpiti Festival of International Laureates, and is the site for five "world class" concerts. Each summer, the festival draws more than 25 award-winning young musicians from 22 different countries to the southland to present a series of solo and orchestra concerts. The 2018 festival consists of 9 days in Encinitas for the talented musicians to prepare and present 5 different concerts. On July 5, 2018 at 7:30pm, the iPalpiti Orchestra will present a concert at St. Andrew's Episcopal Church. From July 12-15, 2018, four Soloists Concerts will take place at the Encinitas Library. The festival also includes concerts in Los Angeles, Beverly Hills, and Walt Disney Concert Hall.